Last week I mounted my GoPro on my boom just aft of the mast, shooting back at me. From this angle I could really see how much my boom flexes while I'm sailing which got me thinking. How is this effecting the performance of my rig? Masts are designed to flex while you're sailing but should a boom remain stiff and static all the time? I definitely noticed a big difference with my simmer sails when I went to a carbon boom--it sailed like a completely different sail. I personally like the feeling of a more stiff boom, and it seems like all of that flex is not very efficient. Very good question. In your situation in the video, the flex is from the choppy water and bounce, and there probably is no impact on the sail, in fact, it may even smooth out the ride some since the sail may stay a little more stable while the boom flexes. Shear speculation. The real question for those of us that sail with formula rigs and huge ? I think the boom shortens and the sail gets fuller with a tighter leach (just a little). If this is true, then the center of force may move a little, and the sail won't twist and dump the excess air as efficiently as a sail that has not become fuller. I have 7 booms, 3 aluminum and 4 carbon (two are new heavy beefed up formula booms, one old long formula boom and one small). Frankly, I don't notice much if any difference and I have been sailing and racing for 25 years. Part of this is that I am lucky enough to have dedicated booms for each sail from 6.6 - 11.0. For my 4 smaller sails, I share two booms. Since I don't rig the larger booms on more than one sail, I guess I really can't compare. I have adjustable outhauls on all the dedicated booms, so it's a hassle to rig different sails on the same boom for testing. The only rig I have trouble with is my 11.0 and the old, long carbon formula boom. For me at 77kg, I don't like this rig if the gusts are pressing 14-15 knots, it's just too much sail, but is this the result of the softer boom or just the big rig? Probably both. adjust for when I'm zipping around at 20MPH (ok 15) in big swells. a lot easier. Below that size, there's a difference, but it's manageable. I have a HPL Carbon boom that I use with my 7.5. (doesn't fit my 6.5) I can really notice how much stiffer it is, but man everything just feels so much better when I sail my 6.5. The center of effort feels much more stable and the rig is a lot easier to control. I'm guessing this is due mostly to my lack of skill and just feeling a lot more comfortable with the smaller kit. I'm going to try and rig up the camera again next time I sail the 7.5 and see how much difference I can see. Unfortunately I sail in very gusty conditions most of the time so it's tough to get my rig dialed in precisely. Perhaps an adjustable outhaul would help with this. WSMag tests concluded that stiff booms are slower than softer booms, if top speed is a consideration, but, MAN do I like the feel of stiff booms, especially when maneuvering. I can't imagine doing tricks with sloppy booms. Another factor in this discussion is the type of sail being used. All my sails from 6.6 up are Maui Sails TR race sails with either 3 or 4 cams. The foil (sail shape) is very stable so a softer boom will have less impact on the COE than an RAF or two cam sail. Again, speculation, but it seems logical to me. Also, with adjustable outhauls, I can further stabilize the sail if anticipating a gust by flattening the sail, assuming it will become a bit fuller because the gust will shorten the soft boom a little. As I said, I have two very stiff formula carbon booms with the beefed up tails which are providing the maximum stiffness, but I don't like the added weight. Since I am only 77kg, the rig weight is important to me. In many parts of the country, including the Gorge and the intermountain west, yer Harken blocks would be overheatin' as you played that AO like a fiddler playing Foggy Mountain Breakdown. You'd need the reflexes of a modern fighter aircraft fly-by-wire system to sense and accommodate the rapid-fire hammer blows torturous topography can induce in frontal winds. Some days the gusts feel like Paul Bunyan is pounding your sail at about logo height with a lightly padded bat almost as rapidly as he can recoil and do it again. The only visible hint of this scenario is confused ripples and cat's paws everywhere; individual gusts seem random and unforetold, and often increase sail power by 50% quicker than you can say the first syllable of "Oh, ....", let alone overcome the inertia of a stainless steel minipulley. In effect, we've seen shoulders dislocate and noses break faster than a few feet of AO line, let alone expert sailors, can react. What you're calling "gusts" we refer to as "increasing winds" or "time to rig down". I suspect you'd label our "gusts" as "rapid cannon fire" or "multiple car pileups". On the worst days our primary cognizance of the nastiest gusts come from an increasing awareness of where we are, how we got there, how much our ribs hurt, and why that danged AO line is wrapped around our ankles. And that's hyperbole only until you've seen Gorge pros and experts experience it in one form or another. Tailwalks and wheelies are like French chocolate silk pie in comparison. What you're calling "gusts" we refer to as "increasing winds" or "time to rig down". I suspect you'd label our "gusts" as "rapid cannon fire" or "multiple car pileups". I can tell the difference between gusts and increasing wind and our gusts can be substantial. I sail in Dallas, Texas and we are in the summer doldrums now, but I got 52 days of sailing between Jan. 1 and July 1. I was out on my 11.0 and formula board last week in 3-18 knots and had plenty of time to adjust the outhaul. However, for me 18 knots on a flattened 11.0 is survival mode, just heading up and keeping the nose down until the gust passes. Plus wind shifts of 30-40 degrees can accompany the gusts and lulls. Being able to see a gust coming depends on water state. I can see that in the gorge, with it's waves and chop, you are quite busy and "reading the water" to see an approaching gust is probably a little difficult. I have sailed the gorge only twice, first time in 1985 and the second round 1995. I was out in 40-45 knot winds on a 3.8 on the first trip, so I am aware of what it's like when it is "blowing" at Doug's beach (it was not fun, just surviving and chalking it up to experience). I don't remember much in the way of gusts in the gorge, but I learned quickly to be patient and not go out too early in the day and get worn out before the building winds hit their peak in the afternoon. On my first trip, I think I got a year's worth of "short board, high wind" experience in just 10 days. 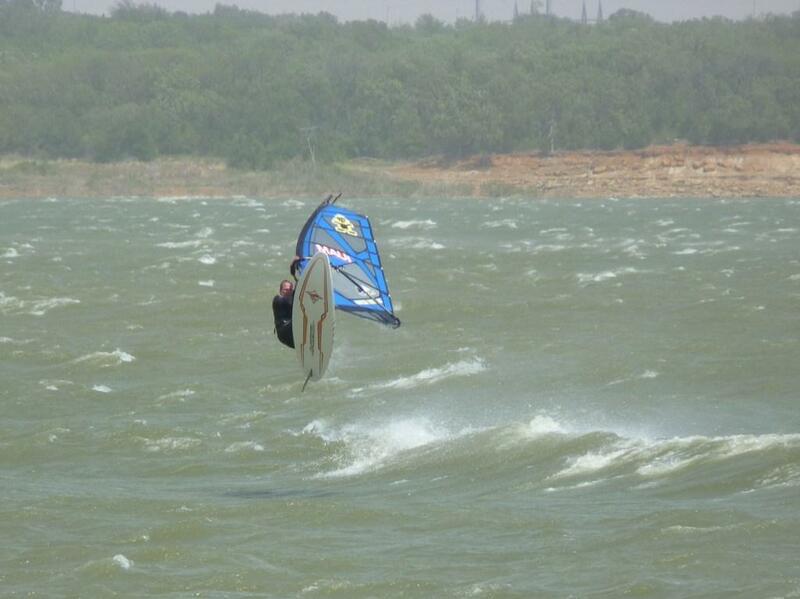 Here is a shot of a buddy on a 35-45 knot day on lake Grapevine near Dallas on a northwest wind this spring. I stayed on the beach and shot photos since my wind gauge was peaking at 50mph and my smallest sail was a 4.0. I am also 66 so I figured I am mature enough to pass up the opportunity. A breakdown could possibly put you on a rock dam 1 mile downwind in 5' chop. My 11 year old fiberspar was getting pretty gnarly. i switched to a Maui Sails carbon boom and fell in love with it. So much, that I called my crack dealer (North Beach Windsurfing) and had him ship me out two more new booms to replace my last remaining aluminum ones. Im just an amateur who blasts around, still working on Jibes, but i feel a BIG difference in my 7.5 6.5 sails with the new booms. that said, I exclusively used a Chinook Course aluminum boom on my 8.5 Severne Element. The new Maui Sails carbon boom absolutely revolutionized how that sail rides. When i weighed the new booms compared to the old ones, the weight wasn't that much different. but these things are so stiff.